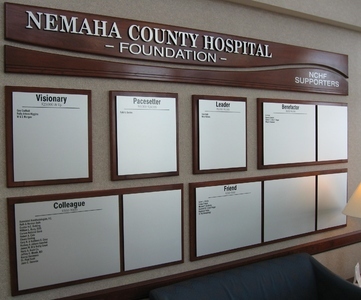 The Nemaha County Hospital Foundation was established in 1990 as a 501c(3) non-profit organization with a mission to support needed healthcare services and hospital project through charitable contributions. Thanks to the generosity of individuals, corporations and organizations, the Nemaha County Hospital is able to provide outstanding medical care for our patients. Your gifts make a difference in their lives, and we thank you! The foundation accepts gifts to fund present and future equipment and program needs. Contributions of any amount are gratefully accepted. You may choose to either specify a designated use or allocate your funds as an unrestricted gift – allowing hospital leaders the freedom to use the funds where they are most needed by the community. Your contribution to the foundation is tax deductible with 100% of gifts benefiting the hospital program or department designated by the donor. The Foundation Board is comprised of people from across the county who care about serving their community, and who exhibit our core values – Integrity, Compassion, Accountability, Respect and Excellence. We invite you to partner with us in giving the gift of life to our patients!